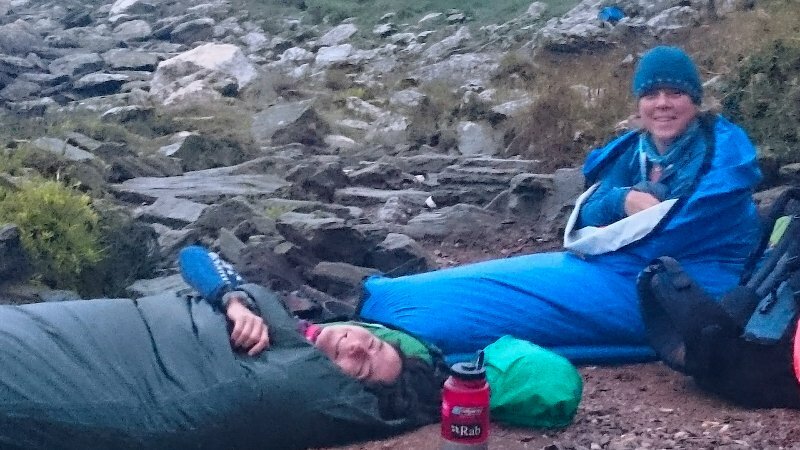 We Blondes recently enjoyed a most excellent Girls’ Bivvy Night (which isn’t the same thing as a Girls’ Bevvy Night but did involve a camp mug of wine). 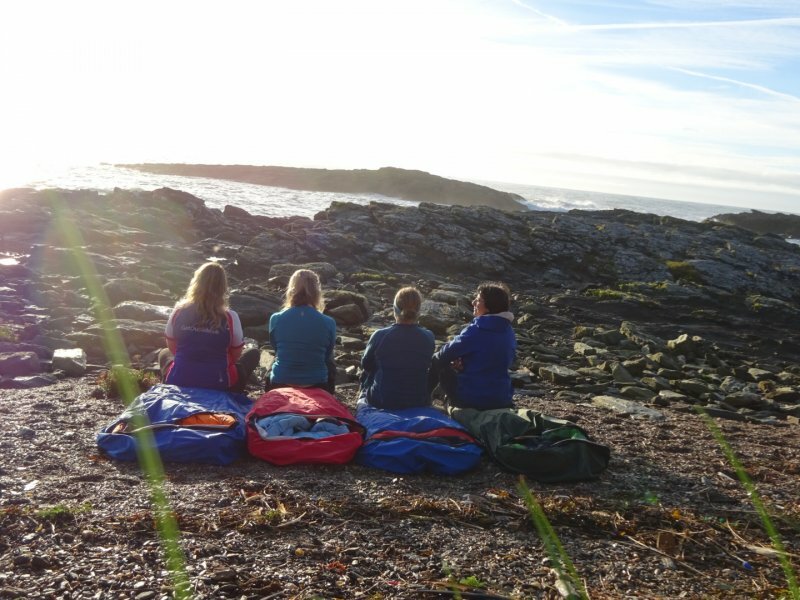 An exciting alternative to wild camping, bivvying is an outdoor activity that I would recommend everyone try at least once. It isn’t everybody’s cup of tea but if you are going to have a bad night’s sleep, you might as well do your (many) waking up sessions directly underneath a sky full of stars. 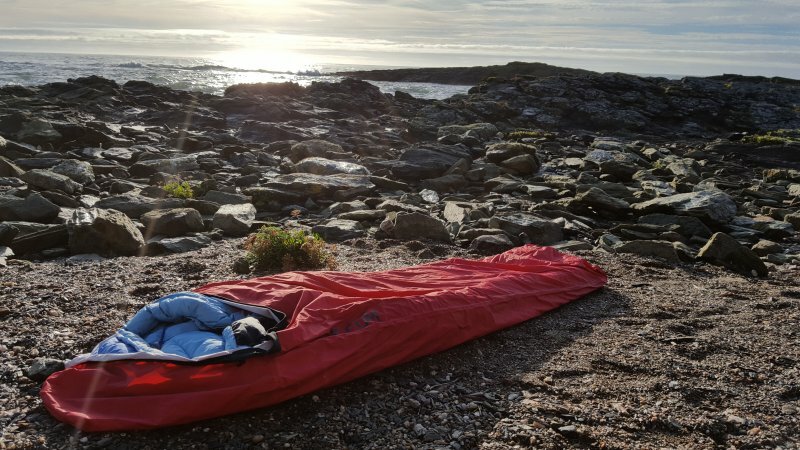 Since I told you about our starlit adventure people have been asking all sorts of questions about how to sleep in a bivvy bag and whether not a bivvy bag can keep you dry, so I thought I would answer some of them. What is a bivvy bag? Good question! A bit of etymology for your first, the word ‘bivvy’ comes from ‘bivouac’, which may or may not come from the Swiss German word ‘Biwacht’, which means ‘additional guard at night’, which kind of fits in with the whole ‘not sleeping very well in my bivvy bag’ thing. 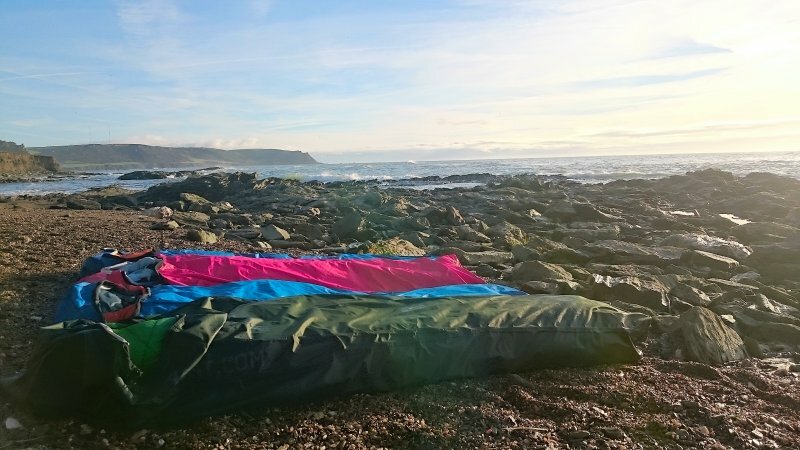 A bivvy bag is a watertight bag that is big enough to fit you, your many layers of clothes, your sleeping bag, your sleeping mat (more about that later), your dog (if you have one) and your pillow system inside. Bivvy bags vary in poshness, 5-Star bivvies are hooped at the head end, breathable, zippable and have a jacuzzi at the end. Others are… well… just a bag. Mine was a present from Mr B2, the Hunka XL is from Alpkit and offers plenty of moving around room (not always an advantage) and warm air ‘lofting’ space (which is a good thing). Tent or bivvy, which is best? Even better question! I like both for different reasons but if I had to choose between my tent and my bivvy bag on a night that I really wanted to feel in contact with the outdoors, I would opt for my bivvy bag (let’s face it, you can’t be in more contact with the outdoors than if it is falling on your face!) Tents are good because they offer you room to move around, get dressed and store your kit away from the wind, rain, ice, snow etc (and yes, I have bivvied in all of those) but a bivvy bag gives you the ultimate lightweight option (I say option because I have not yet managed anything even approaching a lightweight camp), really lets you know that you are outside and makes that, ‘I did that’ feeling slightly more smug in the morning. How warm is a bivvy bag? The answer to this one surprised me. Mr B2 gave me my bivvy bag for a Christmas present so my first outing in it was on New Year’s Eve (always important to start the year as you mean to go on). I was most pleasantly surprised by the amount of warmth I was able to generate (and hang on to) during the night. I have since decided that the warmth of a bivvy bag is down to the smaller amount of air that you have to keep warm. 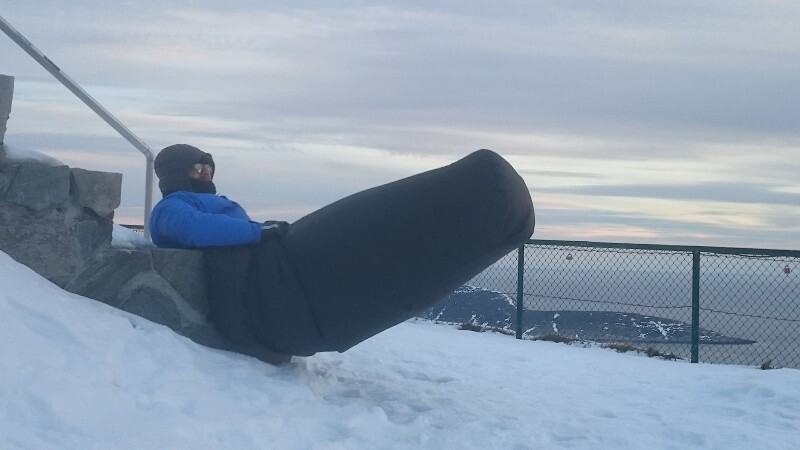 There is balance in this because if your bivvy bag is too small you won’t have any room for extra clothes, moving around or spare air to heat up, so don’t go too small, imagine yourself in three coats, six pairs of trousers and wrapped in a blanket, then buy a bivvy bag that is that sort of size. What equipment do I need for a bivvy? A bivvy bag, a 4-season sleeping bag (even in August if you are me), an inflatable sleeping mat, clothes. 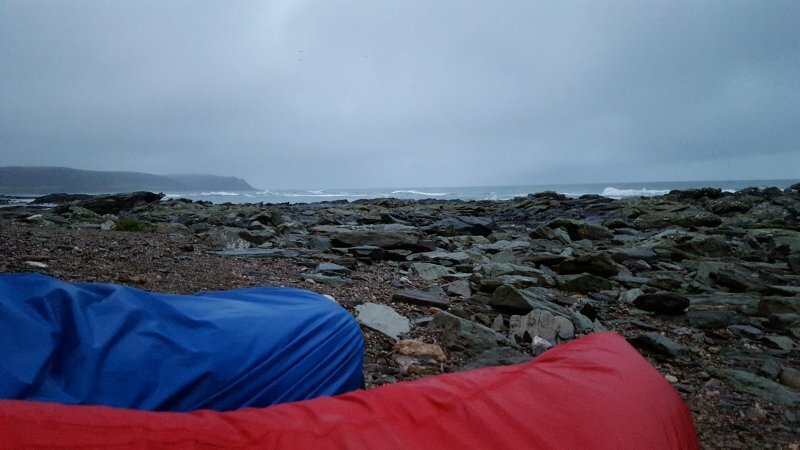 By Blonde standards, that is a very short list but wild camp bivvying is much more about the fresh air and middle-of-the-night views (you would be surprised) than the clever equipment that makes camp life more comfortable. Do I put my sleeping mat inside my bivvy bag? You have opened a can of worms with this one (hopefully said worms haven’t wriggled inside your bivvy bag). The jury is out on where your sleeping mat should be when you bivvy. Mine fits nicely inside my bivvy bag and now I have mastered the ‘hang-on-while-you-turn-over’ technique, which prevents you from ending up underneath your mat, I find it a most acceptable arrangement. The advantages of having your sleeping mat outside your bivvy bag are that you can turn over more freely, can sit up in the morning without looking like a rather flat turtle and have a bit more space. The disadvantage, of course, is that you risk your mat being damaged or getting very wet. Will I get wet in a bivvy bag if it rains? You are asking completely the wrong question here. The question should be, ‘Will I get wet in a bivvy bag if it doesn’t rain?’ to which the correct answer would be, ‘Yes!’ My point is that no matter how breathable your bivvy bag is, it is a thin single skin and has to cope with you exuding a lot of moisture during the night. If it rains you can pull the hood of your bivvy bag over your head (this is also useful if you are being attacked by sand creatures) but no matter what the weather, you should expect a bit of condensation around the top end of your bag. The truth of the matter is that a bit of dampness round the edges won’t hurt you, my bivvy bag has always kept 98% of me dry and I am happy with that. If you are really worried about being rained on you can erect a tarp over your bivvy site but as soon as you do that you lose your view of the stars… or clouds… or bewildering darkness. Where is your favourite bivvy spot? Usually I wouldn’t even consider telling you about my favourite wild camping spots but my best-ever bivvy spot is quite tricky to get to and I don’t think you will be heading off there tomorrow. During our camper trip up to the very top of Norway Mr B2 and I were determined to sleep out all night at Nordkapp (the most northerly point in Europe) and watch the midnight sun. As it turned out, bivvying inside the Arctic Circle is quite cold (who knew?) but we managed to not-sleep between 10:00 pm and 13:00 whilst all the other campervanners were snuggly tucked inside their vans. Definitely my shortest, but still my favourite bivvy ever! Is it safe for a woman to bivvy alone? If you are competent with a map and compass, by far the best way to feel safe when you are wild camping is to head off as far into the wilds as possible. There are safety provisos of course, tell someone where you are going but don’t tell everyone (via social media), but most of it is common sense. We are all capable of making our own judgement about risk, my maxim is not to do something if I don’t think I can do it safely and that applies to men in the same way it does to women. If we go back to Anna McNuff’s ‘Possible to Bonkers’ scale, bivvying brings you closer to ‘bonkers’ than a lot of things… and that, to my mind, can only be a good thing.